Today we have our first interview on EduCoup with 24-year-old Jaime Lee, founder of ‘Kids at SWiTCH’ , a weekend program in Chatswood, Australia that looks to foster entrepreneurial traits, financial literacy and initiative in kids from age five to ten by employing fun and engaging methods. Jamie told me how ‘Kids at SWiTCH’ differs from mainstream education, about the philosophy behind the program and her thoughts on education in general. Some of the main criticisms EduCoup has directed at mainstream education are of the practices of standardized testing , excessive rote learning, and a lack of humanity in the way kids are taught – not to mention the absence of action based learning, and peer-to-peer learning. ‘Kids at SWiTCH’ tackles all these issues head on. Jaime explained the format of the classes, and gave some of her take on what’s wrong with the kind of education many of us consider the norm. “Do you still remember when we were kids and we imagined ourselves as photographers, fire fighters, teachers and police officers? Well, I simply wanted to emulate that feeling and to bring that imaginative world into reality for kids. Instead of teaching them “about” the world, my goal is to teach them “within” a world that is filled with possibilities. Hence, I’ve created the concept of a mini economy. In this mini economy, the children apply for jobs according to their interests and passions. I believe it is through intrinsic motivation that real learning can occur. When children enjoy their jobs, work becomes a learning experience rather than just a means of making money. The children have ownership over their money. They set financial goals for themselves and can choose whether they want to spend their money at the shops or save it at the bank. However, every week the children are charged with rental fees for things such as their chairs as part of their daily expenses. If don’t pay, they sit on the floor. Currently, I have two six-year-old kids who have already bought two chairs, and they are now renting them out to their friends at a higher price! 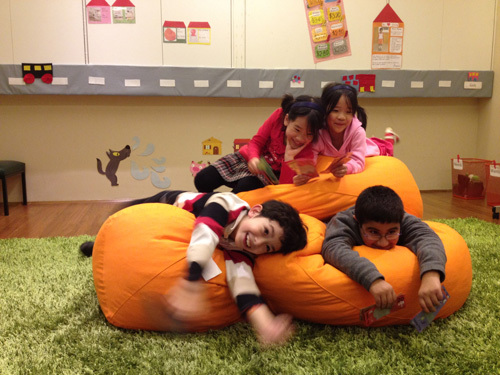 Through tangible and vivid experiences, the children quickly learn that buying assets such as chairs, beanbags and shops can help them generate passive income. During the course, the children are also faced with a variety of economic circumstances, such as inflation, deflation, paying taxes and losing their jobs. This process allows the children to understand the importance of making investments and to create a second source of income. My goal is to empower them. I want them to feel like they’ve taken command of a body of material and can actually do things with it in the real world. I’m not interested in teaching them the skills to ‘survive’, but the skills to ‘thrive’. Mentally I am empowering these kids to look for opportunities to be the architects of their own learning. Emotionally I am helping them to see that they are capable of making enormous contributions to society. And socially I am mentoring them to work together and to take their play seriously. Jamie had eight students for the first term and has had emails of gratitude, invitations to lunch, and requests to host birthday parties from the parents of those children. Sometimes the kids are enjoying themselves too much, and don’t want to come home. “I see education as an art, not a science and it must come from the heart. It’s so important for teachers to realize that in years to come, their students may not remember much about what they’ve taught them, but they’ll always remember how they’ve made them feel. If there’s one thing that I could do to change our education system I’d add more quality “listening time” into a teachers’ day. A time where teachers can listen to the students’ stories, finding out about their hopes and dreams, and becoming acquainted with their aspirations. Often, it is through listening that I was able to lead based upon what I’ve learned. Learning is reciprocal, and with this kind of experience, our kids do not need to care about trying to fit in. They are free agents in letting their creative and imagination run wild. I’d like to thank Jaime for taking part in this interview and sharing the wonderful work she’s doing with ‘Kids at SWiTCH’. I feel so humbled to be able to share my passion through this interview with Educoup. Thanks Jaime! great to have you on!